On Saturday November 7, 2015 this electrical box located in Lookout Park was newly painted. By Sunday morning the box had been tagged. 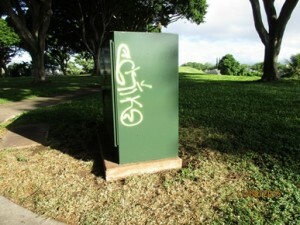 If you have any information about this vandalism or any other defacing of public or Association property please contact the Site Manager at 681-0866. Every time this happens it costs all of us money. Please help us stop this nuisance. On November 2, 2015 a small dog was attacked and killed by a large white dog on Aipo’ola Street. If you have any information about the incident please contact the Honolulu Police Department using the following police report number 15-439044. It would also be appreciated if you would contact our site manager with the information.